I always find something to be inspired by at every wedding, and it’s usually the in the details or the emotions of a wedding. For Taylor & Sam’s wedding last Saturday, it was both. 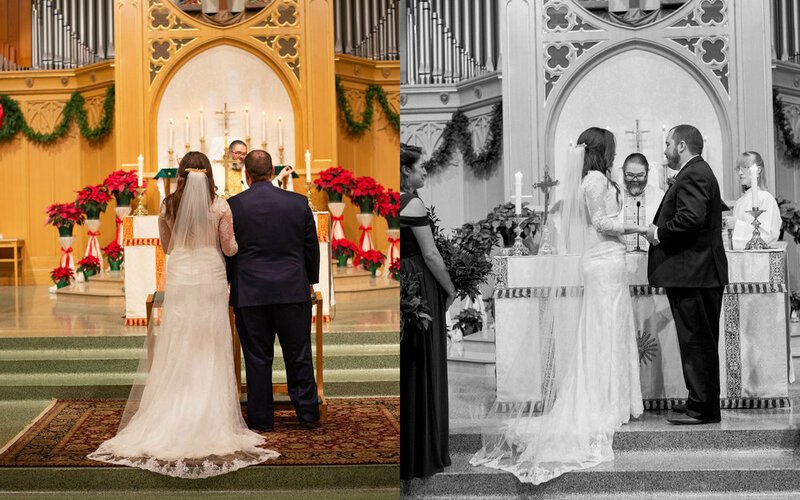 When I walked into Sacred Heart Church in Robinsdale, MN, and saw the beautiful, high vaulted ceilings made of wood, the huge windows casting gorgeous natural light throughout the lobby of white brick and the simple holiday decor, I knew this was going to be a special day. Taylor wore a gorgeous dress full of simple lace details. She wore a gold-leafed veil clip that held in her cathedral-length veil that her grandmother hand-made and embroidered for her that fell with the length of the lace train. She carried a bouquet of greenery and three bold Proteas (a tropical flower with tons of texture and rich colors). And she wore the biggest smile on her face. Sam wore a navy blue suit, classy brown shoes and a corsage made of eucalyptus that smelled divine. I love simple details with lots of character! His face lit up every time Taylor entered the room. The flower girl, age 8, wore a crown of Babies Breath, eucalyptus and greenery to match the other florals and her dress mimicked the same lacy details of Taylor’s dress. We were able to get some gorgeous portraits of the two of them by the dramatic windows with some really wonderful natural light! Even their wedding party was on point and so supportive! The men wore the same blue suit as the groom and the ladies were radiant in their red dresses that were all as unique as their owners. Most of the wedding party were siblings to Sam and Taylor, or lifelong friends that they chose as family. The men shared a celebratory cigar half an hour before the ceremony. It was a bit chilly to stand outside and enjoy the entire cigar, but it was a nice sentiment! Their ceremony was classic and elegant, personal and sweet. I felt so lucky to have had a chance to shoot at such a lovely church. I felt even luckier that this church had no restrictions for me, so I could shoot as I pleased and get some amazing shots for the couple! After the ceremony, the wedding party (along with me) traveled to Rockwoods Event Center in Otsego, MN, for the reception. With approximately 260 guests, the place was packed and ready to welcome the newlyweds as they entered the reception hall as Mr. & Mrs. Munn! The speeches were full of emotions and happy tears (including the groom!) and the couple spent the night dancing and celebrating with their friends and family.